Developing and Delivering Practice-based Evidence promotes a range of methodological approaches to complement traditional evidence-based practice in the field of psychological therapies. Michael Barkham is Professor of Clinical Psychology and Director of the Centre for Psychological Services Research at the University of Sheffield. He has published approximately 150 scientific papers and 30 book chapters in the fields of clinical psychology, counselling, and psychotherapy and has an abiding commitment to strengthening the paradigm of practice-based evidence. Gillian E. Hardy is Professor of Clinical Psychology and Director of the Clinical Psychology Unit and the Doctorate in Clinical Psychology training programme at the University of Sheffield. She has published extensively in the field of psychotherapy outcome and process research. John Mellor-Clark has been engaged in the evaluation of UK psychological therapies and counselling for the past 20 years. Through the mid-1990s, he led the development of the CORE System as the first standardised quality evaluation system in the UK for psychological therapy. Today this system is used by over 250 services and 3,500 clinicians to help measure, monitor, and manage therapy outcomes. SECTION I: EVIDENCE-BASED PRACTICE AND PRACTICE-BASED EVIDENCE. 1 The Current View of Evidence and Evidence-Based Practice (Peter Bower and Simon Gilbody). 2 Building a Rigorous and Relevant Knowledge Base for the Psychological Therapies (Michael Barkham, William B. Stiles, Michael J. Lambert and John Mellor-Clark). SECTION II: METHODOLOGICAL PLURALISM FOR INDIVIDUAL PRACTITIONERS. 3 Scientific, Practical and Personal Decisions in Selecting QualitativeMethods (Nancy Pistrang and Chris Barker). 4 Theory-Building Case Studies as Practice-Based Evidence (William B. Stiles). 5 Single Case QuantitativeMethods for Practice-Based Evidence (Dean McMillan and Stephen Morley). SECTION III: MEASUREMENT SYSTEMS FOR INDIVIDUAL PRACTITIONERS AND SERVICES. 6 Outcome Questionnaire System (The OQ System): Development and Practical Applications in Healthcare Settings (Michael J. Lambert, Nathan B. Hansen and S. Cory Harmon). 7 Treatment Outcome Package (TOP) - Development and use in Naturalistic Settings (David Kraus and Louis G. Castonguay). 8 Clinical Outcomes in Routine Evaluation (CORE) - The CORE Measures and System:Measuring,Monitoring andManaging Quality Evaluation in the Psychological Therapies (Michael Barkham, John Mellor-Clark, Janice Connell, Chris Evans, Richard Evans and Frank Margison). SECTION IV: MONITORING STRATEGIES FOR INDIVIDUAL PRACTITIONERS AND SERVICES. 9 Using Benchmarks and Benchmarking to Improve Quality of Practice and Services (Robert J. Lueger and Michael Barkham). 10 Constructing and DisseminatingOutcome Data at the Service Level: Case Tracking and Benchmarking(Chris Leach and Wolfgang Lutz). SECTION V: MANAGING IMPROVEMENT VIA ORGANIZATIONS AND PRACTICE NETWORKS. 11 Organizational and Conceptual Framework for Practice-Based Research on the Effectiveness of Psychotherapy and Psychotherapy Training (Robert Elliott and Alberto Zucconi). 12 Practice Research Networks and Psychological Services Research in the UK and USA (Glenys Parry, Louis G. Castonguay, Tom D. Borkovec and Abraham W. Wolf). SECTION VI: DEVELOPING AND DELIVERIPRACTICE-BASED EVIDENCE. 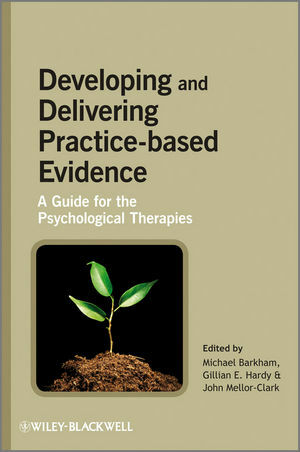 13 Improving Practice and Enhancing Evidence (Michael Barkham, Gillian E. Hardy and John Mellor-Clark). "The field of psychotherapy has witnessed an increasing emphasis on the need for research evidence that can inform clinical practice. As this volume most clearly illustrates, however, there is also an important need for clinical practice to offer input on the effectiveness of our treatments. More than just providing lip service to closing the gap between research and practice, this edited volume gives us specific suggestions and guidelines for how this may be done. Indeed, it is a major contribution in our search for therapy interventions that have both a firm grounding in research evidence and converging support from clinical reality." "We are now familiar with evidence based practice that has powerfully influenced service provision in the psychological therapies. As practitioners however, we are acutely aware of its limitations. Research that informs the evidence base we are routinely referred to is distant and remote from our experience. It feels disempowering as our every day practice is influenced by randomised controlled trials that espouse a medical model that does not reflect the diversity and complexity of practice as counsellors, psychotherapists and psychologist know it. We are acutely aware that clients with a single diagnosis are rare and that our clients come in unique packages that could never be captured in a meaningful group that could reliably be randomised for trial purposes. Practitioners have been marginalised and disempowered by current research paradigms and it is time for a change. This book provides just the change in emphasis that we are looking for and indeed hungry for. It provides a comprehensive account of everything a practitioner needs to know about the generation of practice based evidence. It is just the book that is needed to inspire practitioners to engage with research through meeting with others in practitioner networks or influencing the agencies they work in, to start collecting data. A ground swell of researcher practitioners engaging in meaningful research with their own clients or agencies can influence theory and practice for the future. Indeed practice based evidence could become the new evidence based practice. Many advocates of practitioner research, who have themselves already made substantial contributions to theory and practice through the development of theories, instruments and systems have contributed to this book. Indeed, it is a potentially historical text that captures in one volume the assembled knowledge of the vanguard who will lead essential changes in the way that knowledge is generated in the field of psychotherapy. It has the potential to be revolutionary as it becomes a recommended text for psychotherapy researchers and practitioners that will herald a shift in how research is conducted, who does it, how it is reported and the influence it will have on future services."